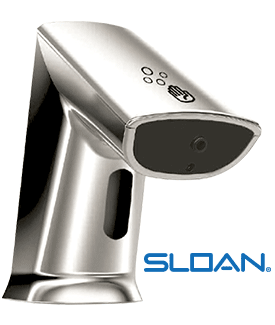 Sloan model no. ESD-400 Infrared sensor activated electronic soap dispenser. It uses a refill bottle that simplifies replacement and reduces waste. Its sensor technology offers hands-free operation by delivering a pre-measured foam soap application "on demand." The product shall be tested and certified to industry standards. Mount soap bottle to the foam tank case unit. Press the reset switch, which begins the pumping cycle to purge air from the tube. This step may be required twice to completely prime the unit. Place your hands under the foam soap dispneser. The sensor will detect the presence (approximately 0.6 seconds) and dispense foam soap from the foam soap dispenser. 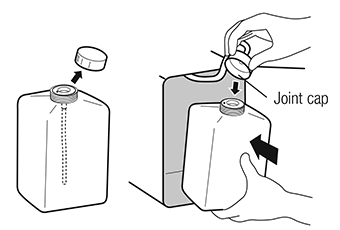 Check for leaks from the bottle or dispensing unit. Soap should only be dispensed through the outlet spout. NOTE: This procedure must be completed every time a bottle is replaced. 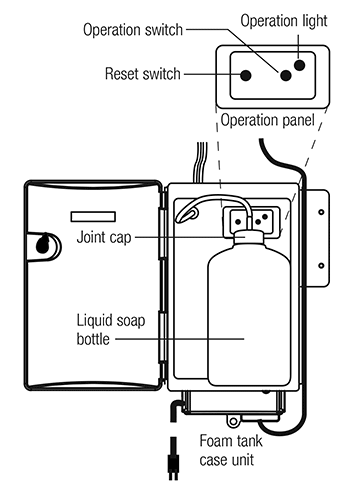 The foam soap indicator light on the foam soap dispenser blinks and stops dispensing when the soap bottle in the foam tank case unit runs out. Change the soap bottle. Turn the key to open the foam tank case unit cabinet door. Remove the joint cap and dip tube and discard the empty soap bottle. Insert the dip tube and attach the joint cap to the new bottle and install the bottle in the tank cabinet. Be sure to attach the joint cap securely. Close the door and lock using the key. For reliable long-term use, perform regular maintenance on the unit. Be sure to turn off the operation switch and check that the operation light is off when maintenance is done. Remove soil with a soft, dry cloth. If the unit is seriously polluted on portions other than the hand sensor, use wet cloths with properly diluted neutral detergent. Remove the detergent with a soft, damp cloth and then rub with a soft, dry cloth.